Virtual Machine Connection (VMConnect) lets you use a computer's local resources in a virtual machine, like a removable USB flash drive or a printer. 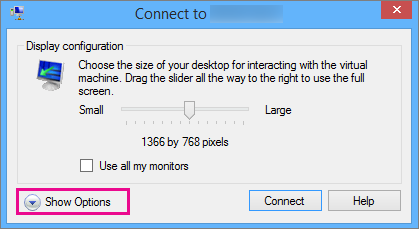 Enhanced session mode also lets you resize the VMConnect window. 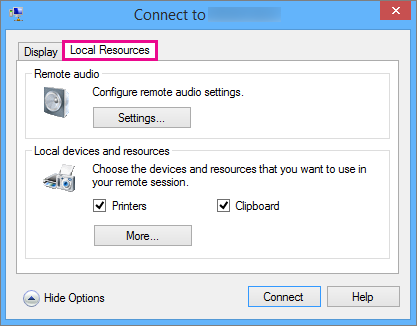 This article shows you how configure the host and then give the virtual machine access to a local resource. 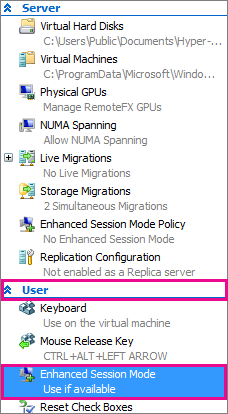 For virtual machines that run Ubuntu, see Changing Ubuntu Screen Resolution in a Hyper-V VM. 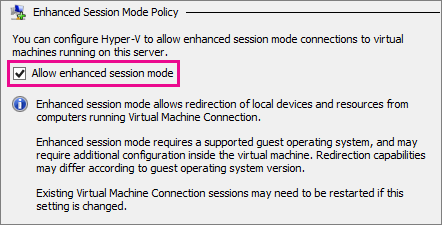 If your Hyper-V host runs Windows 10 or Windows 8.1, enhanced session mode is on by default, so you can skip this and move to the next section. But if your host runs Windows Server 2016 or Windows Server 2012 R2, do this first. Connect to the computer that hosts the virtual machine. In Hyper-V Manager, select the host's computer name. Under Server, select Enhanced session mode policy. Select the Allow enhanced session mode check box. Under User, select Enhanced session mode. Local resources include printers, the clipboard, and a local drive on the computer where you're running VMConnect. For more details, see Requirements for using local resources, below. Select the virtual machine that you want to connect to. 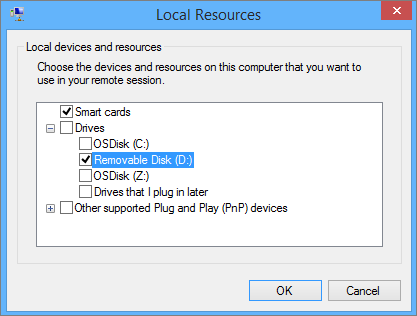 Select the drive that you want to use on the virtual machine and click Ok. 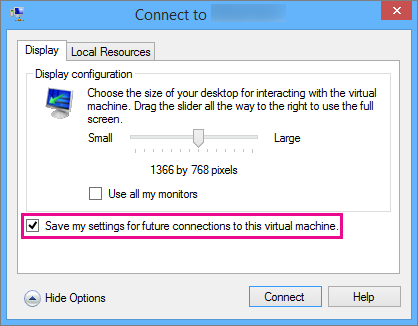 Select Save my settings for future connections to this virtual machine. 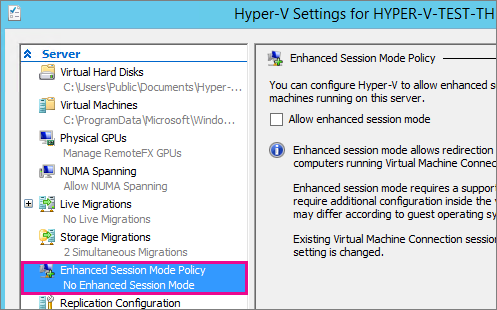 The Hyper-V host must have Enhanced session mode policy and Enhanced session mode settings turned on. The computer on which you use VMConnect must run Windows 10, Windows 8.1, Windows Server 2016, or Windows Server 2012 R2. The virtual machine must have Remote Desktop Services enabled, and run Windows 10, Windows 8.1, Windows Server 2016, or Windows Server 2012 R2 as the guest operating system. Why use a computer's local resources? Troubleshoot a virtual machine without a network connection to the virtual machine. 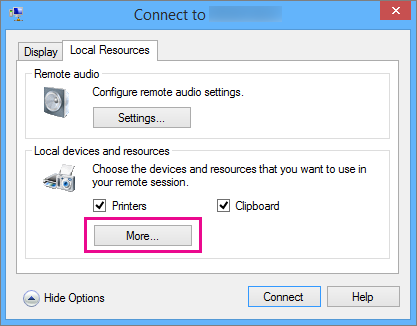 Copy and paste files to and from the virtual machine in the same way you copy and paste using a Remote Desktop Connection (RDP). Sign in to the virtual machine by using a smart card. Print from a virtual machine to a local printer. Test and troubleshoot developer applications that require USB and sound redirection without using RDP.